The Broncos finally got their revenge on the most hated team in the NFL, the Raiders. Denver traveled to Oakland for a rematch of a win that should've happened in week one and our boys delivered... big. First half was weak and looked grim for awhile but we kept up with the speed of things. 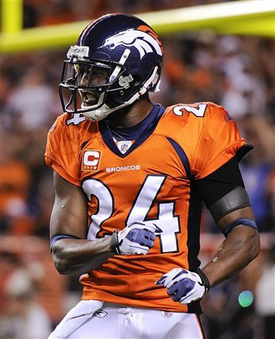 That is the Denver team I know & love.... completely unpredictable & showin' their most hated rival up in their own house. F.U.N.N.Y. Much improvement in many areas, starting with none other than Tim Tebow. Tebow had such a great day compared to his other 2 starts. So much improvement, I'm excited for him. I'm so so glad that Coach Fox stuck with him the whole game, trusted him to pull through, to improve, gave him a fighting chance and didn't resort to Brady Quinn at all. I shutter to think what disaster that would've been had Quinn been put in there. We would've got creamed. I'm proud of Tebow for what he did in this game. Always room for more impr ovement and he's got plenty more to work on. It was far from a perfect game for him but it was darn close. Even VP of Operations John Elway had good things to say about his performance and that's huge. That's the kind of feedback Tebow needs when we all know he had a good game. His stats for passing were 10/21 for 124 yards, 2 TDs and NO interceptions. For rushing, Tebow ran 12 times for 118 yards. 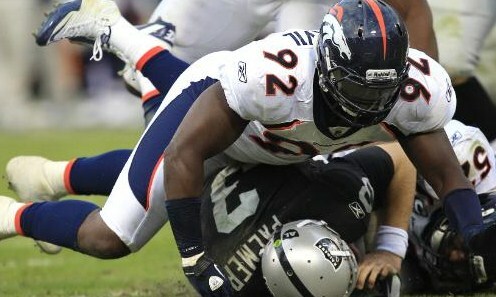 The line was better protecting Tebow but still coughed up a few penalties and 2 sacks. I think its understandable that it would take awhile for the line to adjust to protecting a left handed QB in Tebow vs. Orton but they shouldn't be having this much trouble with it. The line is Tebow's lifeline cause every defense is going to be hungry to get sacks on him, that front 5 better figure out a rhythm while Tebow is out there. KC is gonna be real hungry after losing to Miami of all teams, if our line doesn't hold up all game, Tebow's gonna have one green jersey. Our rushing game has been fun to watch for once. 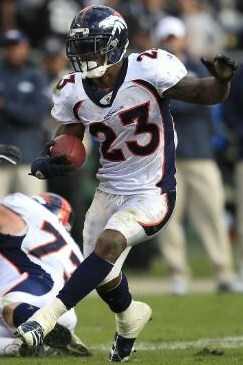 Willis McGahee was on fire Sunday afternoon rushing 20 times for 163 yards and 2 touchdowns. What was really impressive from this offense was the one-play TD in the 3rd quarter. 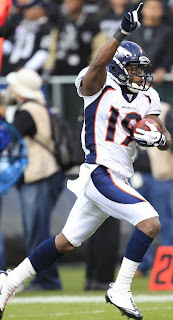 Tebow handed the ball off to McGahee and he took all the way for a 60-yard TD to tie the game at 24. Awesome play from the entire offense to make that happen. So awesome to see our offense pull something like that off. So be sure to vote for our own Willis McGahee as he is nominated for the FedEx Ground Player of Week. McGahee is also featured on 'Let's Go Primetime' as get this... the #1 playmaker of the week. Never thought I'd see the day. Ch-ch-check it out here. 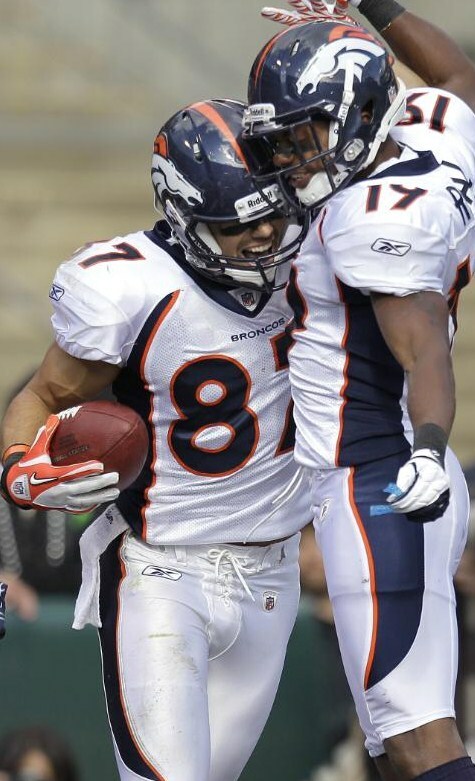 Eric Decker was quiet after his 1st quarter TD but still a playmaker I love watchin out there. And good ol Eddie Royal... its about time he get involved in our offense more. He only had 2 receptions for 25 yards but one of those catches a big TD in the beginning of the 3rd quarter and a big return in the 4th. Overall a much better game from our offense. Was very pleased with their fight & drive to get the win. They came out fighting so hard in the 3rd quarter & carried that into the 4th. Talking about the whole team, not just offense because our defense held down the fort in the end. Like it was for the offense, a tough first half. Struggled to find their groove but owned the 2nd half. 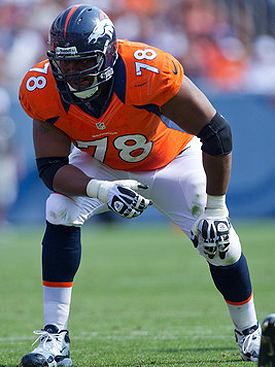 And Dumervil finally broke through and got his first sack of the season. 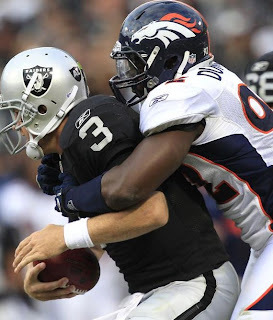 Later on Von-Doom got a piece of Palmer giving Doom 1.5 sack credit & Von 0.5 credit. Hopefully this deadly duo will wreak havoc on KC this coming weekend. Elvis is back in the building baby! 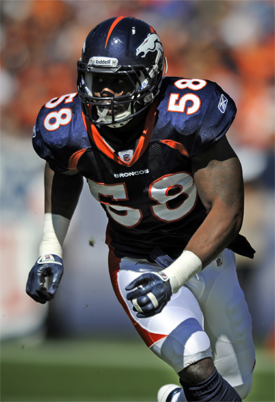 Rookies Quinton Carter & Von Miller had a combined 11 tackles. The defense really pulled this one through for us by holding off the Raiders at the end. Penalties are a given when we play the Raiders, but DAAANG!! 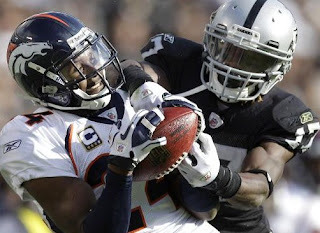 Denver ended up with 11 for 93 yards but the whopper came from Oakland (thank goodness) with 15 for 130 yards! bahahaha Some of those were kinda lame but if they're on Oakland, who cares!? That makes for a funny game. We have got to work on this penalty thing. They are killin us. Those 11 penalties could have been a huge deal breaker for us. 11 is unacceptable... heck, 1 is too many. Most of them are silly & very preventable. Holding calls, false starts, we're better than that. They know better. In the end though, we left with the W and that's what matters but we weren't that far behind Oakland in penalties. We can't afford to rack those up every game & expect to get away with it. Von-Doom sack on Palmer – Boom Baby!! Orange Crush those Chiefs!!!! Would be huge if we win in KC, huge! If Miami can do it, we can run 'em into the ground. So here's how the game went with my friend. We were gonna go to a restaurant since I don't really want to go watch a game in a bar and then we find out they aren't showing the game cause they don't have NFL Sunday ticket... lame!! Although I get it cuz its overpriced otherwise I'd have it again. So we had ate an appetizer at this place then left and just 2 blocks away was a bar type place with like a million pool tables and one HUGE TV screen... and the Sunday Ticket! So we missed good portion of the first half including Decker's TD. The 2nd quarter man, things weren't looking good for Denver and soon discovered I was surrounded by stupid Raider fans... yeah I was the ONLY Bronco fan there. So freakin' funny. So then the 3rd quarter started and that's when we came alive. Oh my word, my friend started lookin' around like I don't know this girl cause EVERY time we made a big play (ints, TDs, big runs, big passes, sacks, anything), I was cheering them on and the place was dead silent. I couldn't stop laughing. It was then my friend really realized that I can handle my own anywhere. He could not believe that I was cheering my team on like I was with all these raider fans around. Then again if they wanted to throw anything at me or whatever, they had Bonnie & Clyde up in there. lol I think people were afraid to really razz me cuz while my friend is a cool dude, you mess with him or anyone he knows, you in BIG trouble. 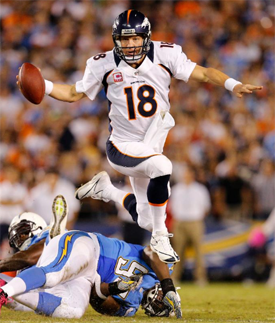 And then me, well I can unpredictable as this Denver team and defend myself. Anyway, was really fun. So the second the game ended & the clock said 0:00 I shouted "woo hoo" again and a few guys were laughin like you're still at the bottom of the West. I go right now I don't care cuz we're fighting our way back and we got a big W today, that's what matters. So then my friend, he's like ready to leave ASAP and I told him no, I need to savor this moment. haha So we stayed and watched the Pats lose & the Chargers lose which made him a little happy. lol and we left, man the place got so packed while we there, I walked out of there with the biggest smile on my face, he's trying to keep the distance from me ahaha. And right before we walk out the door, I put my arm around him and ruffled up his hair with my fist. LOL Fun fun day. I enjoyed every minute of this game. Haha nice Princess good read, and thanks for the post, I figured you were busy. On to the Chiefs. You going to the game Princess? As of now, not going. The fans here are just brutal, I have a better chance of surviving the fans in the Black Hole. lol Chiefs fans are just plain nasty to rival teams. But I can get real good seats for $30 each, just not sure if putting up with the fans are worth it. But I'd love to go, believe me. 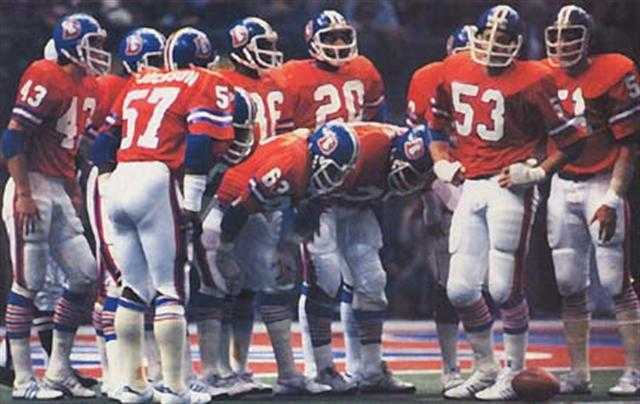 Maybe go underccover, as in plain clothes then decked out in Broncos gear haha. Yeah would be pretty sweet, may be the only time you get to see Tebow as the starter for the Broncos?